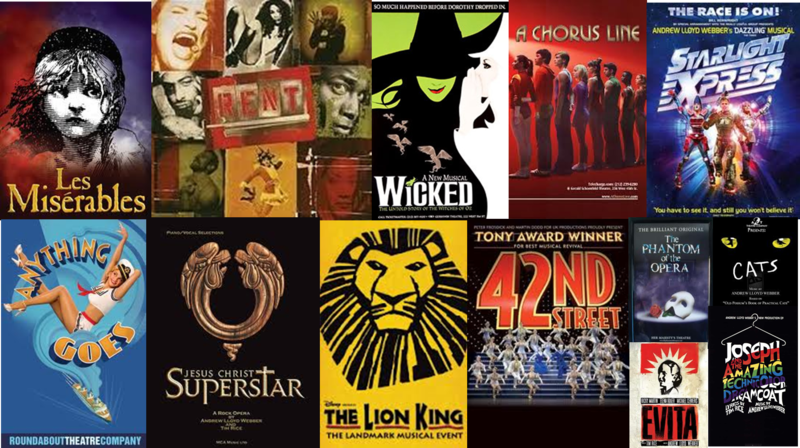 I love everything that has to do with the theatre and musicals, so choosing top 10 musicals that I love was really hard. So I split it in 2 (which expanded my options to 20 :)). First up, My Favorite Movies then My favorites from the Stage. There were no repeats (i.e. musical that I loved like My Fair Lady & Sound of Music I had to decide which one I prefered, the movie or the stage version). Why the distinction? – well some shows were great on the stage but failed on the movie, some things are the opposite. Some things I experienced on the stage, while others I saw first as movies and therefore made more of an impact on me that way. Some are not in both categoies and in general I wanted a chance to choose 20 and not 10. So here goes. 2. My Fair Lady Audrey Hepburn at her best (even though it is not her singing!) Ive been obsessed with this movie all my life! From the songs, to the music, the fashion & Covent Garden. 3. Sound of Music The movie that introduced us to Julie Andrews, and a classic for me growing up. The songs are fabulous, and I grew up singing them! Julie singing Sound of Music & Christopher Plummer singing Edelweiss are just some of the great moments of this movie . SIde note, after watching this i always wanted to make clothes out of curtains! 5. Grease Not much to say here – Its a classic and the songs are relevant even now. I’ve also performed this musical (i was Jan) so it holds and extra special place. 6. The Little Mermaid The movie that started the Disney Renaissance. It was also one of the first movies i went to see in a movie theater and it stayed with me. Besides how can Part of Your World not be on this list! 7. Moulin Rouge A great modern take on the Movie Musical. It is perfectly made for the screen as the effects are wonderful. Elephant Love Medley is a classic! 9. The Wizard of Oz Judy Garland + Somewhere over the rainbow = it had to be on the list! 10. Chicago Oscar Winner and a fabulous reinterpretation of a show that actually on the stage I didnt enjoy as much. Making this list I realized I havent watch the following movies: Gigi, Funny Girl, Cabaret, West Side Story, even though I’ve seen shows of them. Shame on me I will watch them and report wether they crack the top 10. I think my list has more to do with memories of them than their actual quality – but here goes, my attempt at my top 10. 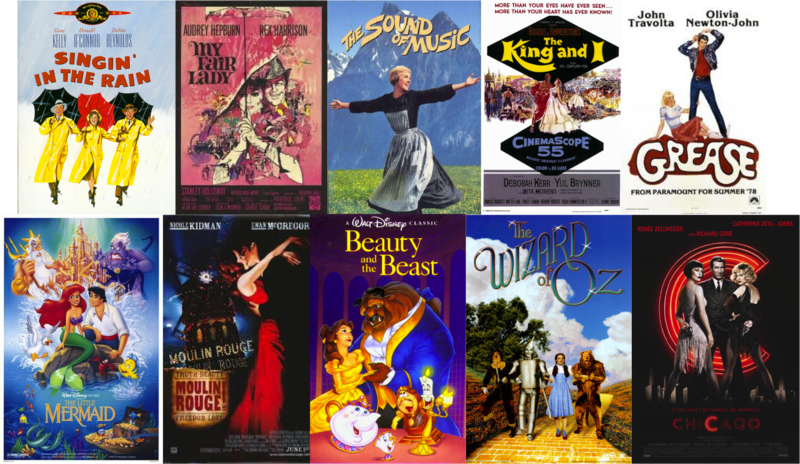 Caveat, these are not the 10 best musicals, you can look at the critics of the AMI lists for that, these are my 10 favorites which is a very different story! 1. Les Miserables For me it ‘s the epitome of a musical. All the songs move me and I have cried every time I’ve seen it (which goes to the double digits). My favorite musical moments include On My Own, One Day More, Empty Chair and Empry Tables & I Dreamed a Dream. 2. Rent Since I was in high school I could sing this musical through, including the spoken parts (i think it was one of my most played Cds). Afterwards its just been an obsession of me and my sister – even going to see one of the final performances on Broadway. How can you not love a musical that introduced us to Adam Pascal & Idina Menzel as well as to songs such as Seasons of Love & without You! 3. Wicked This is the type of musicals I like: good emotional story, wonderful melodic music, great sets and costumes and and epic feel! below a clip of my favorite song: For Good. 4. A Chorus Line A classic musical about a musical! One is one of my favorite songs ever of musicals. 5. Anything Goes I really enjoy the music of Cole Porter and this is why I love this musical. The story is stupid, but thats not why i like it. Its about a fabulous medley of songs and some of the best tap dancing! Below two clips, with two of my favorite actresses that have played the lead: Sutton Foster and Patti Lupone. 6. Jesus Christ Superstar I grew up listening to Andrew Lloyd Webber so there are going to be a couple from him here. Jesus Christ is the first one, because it brings back a lot of memories as I worked closely with it putting it up in College. Also it has some beautiful melodies such as I don’t know how to love Him & Could we Start Again Please. 8. Starlight Express This one is very personal as I know it is clearly not in the Great Quality lists. It was one of the firsts musicals I ever saw and the song Only You was constantly in my head all of my life! 10. The Rest of Andrew Lloyd Webber: Ok so since I couldn’t decide which ALW show to put in my last slot, Im making another tie and just saying that I love them all.